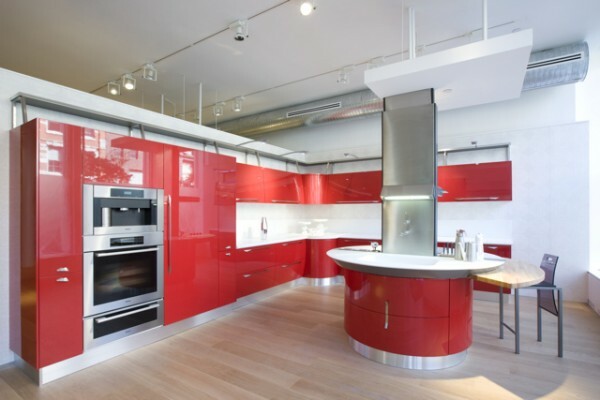 If sleek Italian kitchens send your heart racing more than a Maserati ever could, stop by Scavolini’s new Soho location at 429 West Broadway for a test drive. The showroom, which opened to the public yesterday, is the manufacturer’s first U.S. flagship and features 15 kitchens designed to show off a range of modern and traditional styles. 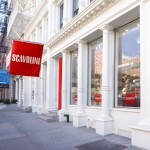 Scavolini worked with SpaCe Architects to design the 10,000-square-foot space on two levels in what was formerly the Nancy Hoffman Gallery. Inside, the showroom maintains a gallery feel. Red glass stairs float within a webbed enclosure above a floor of river rocks, leading clients downstairs to large work tables where they can meet with the gallery team (who trained at the company’s facility in Italy) among more kitchen displays. The showroom will also feature a dedicated working kitchen, Scavolini’s popular Crystal design updated with a new pattern by Karim Rashid and the latest Wolf and Sub-Zero appliances—be sure to stop by for a cooking demonstration, or snag an invite to the official grand opening party on November 16. March 26, 2018 What’s in chef Wylie Dufresne’s kitchen?